Medals Awarded / Medalau a ddyfarnwyd: British War Medal. Victory Medal. John Edward Jones was killed in action on the 12th August 1918. He was 18 years old. John Edward Jones was born in Rhuddlan in about 1899. 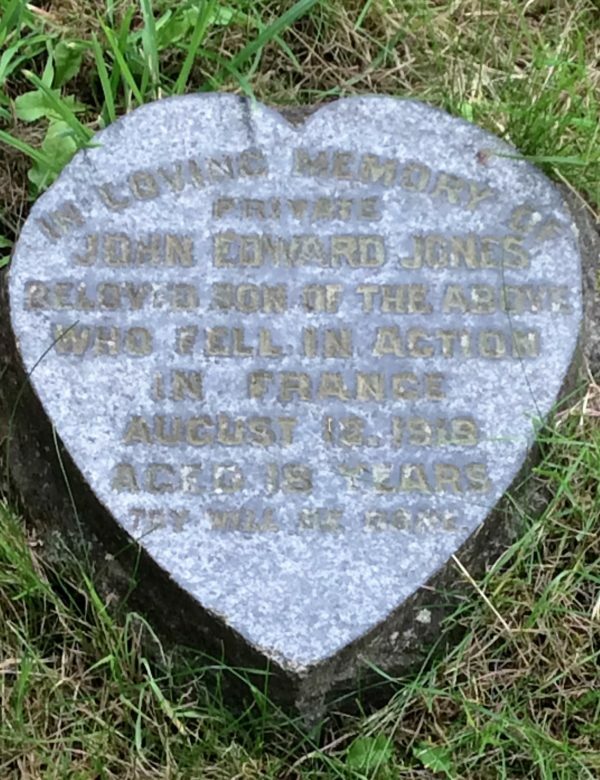 He was the son of Robert and Mary Jones. The 1901 Census records the family at Rhydyddauddwr Farm, Rhuddlan. John was the younger [age 1 year] of two children, the elder child Mary, was 4. The family spoke both Welsh & English. Robert’s occupation was given as, farmer. The 1911 Census records the family now living at Mona Villa, Rhuddlan. Robert’s occupation is given as, “owner of a thrashing machine”. The two children were still living with their parents and were recorded as “scholars”. According to his Attestation Record [Ancestry], John attended a Medical Board at Wrexham on the 18th December 1917. He was passed Grade 1 and was posted to 53rd Young Soldiers Battalion. His age was recorded as 18 years 1 month [giving a birth year of 1899] and his former occupation as “munitions worker”. At this time the Rhuddlan Foundry [previously manufacturing Internationally renown Agricultural Machinery] was manufacturing munitions, particularly 18 pound shell cases. [Rhuddlan in Peace & War 1911- 1922] It is possible therefore, that John was previously employed there. Rhuddlan Foundry. picture credit Rhuddlan Local History Society. As a consequence of the training requirements of this large number of young conscripts, various “Young Soldier Battalions” were set up, which then fed into different Regiments. According to “British Regiments, 1914 – 1918 by Brigadier E. A. James”, the 53rd Young Soldier Battalion was renamed, The Royal Sussex Regiment, in October 1917. However the inscription on the CWGC memorial at Lindenhoek [though no photograph on the CWGC website] records John as having served with the East Surrey Regiment. There is a Flintshire Roll of Honour Index Card for him at Hawarden Records Office, which identifies him as serving with “London Regiment”. At what point John was posted to the front, cannot be determined, but he must have been a casualty relatively soon after his arrival. However, in reporting his death the Rhyl Journal refered to him being about a month at the front. On duty with a Lewis Gun, he died instantly from a shell burst during a tremendous bombardment. Quoting the C/O’s letter of condolence, the paper went onto say that his loss was keenly felt by all his colleagues and that he was one of the brightest and trusty of pals. He is remembered on Rhuddlan War Memorial, The Royal British Legion Roll of Honour [in the Community Centre], St Mary’s Church Roll of Honour and window. 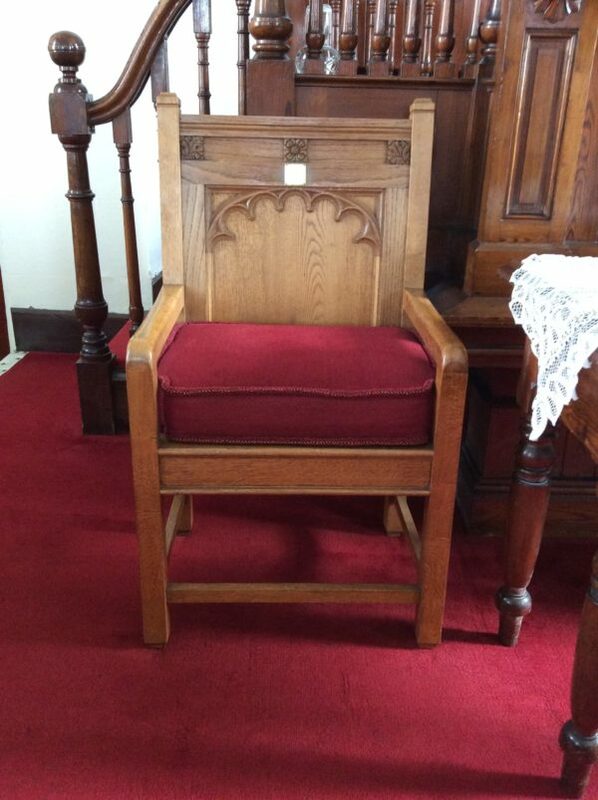 He is also commemorated on the Memorial Chair in Ebenezer Calvinistic Methodist Chapel, Rhuddlan and the North Wales Memorial Arch at Bangor. There is also a heart shaped memorial to him, on the family grave in St Mary’s Churchyard. Stone on Parents Grave. Rhuddlan Churchyard. I am indebted to Sarah Hodnett of Rhuddlan Local History Club, for her assistance in compiling this report.